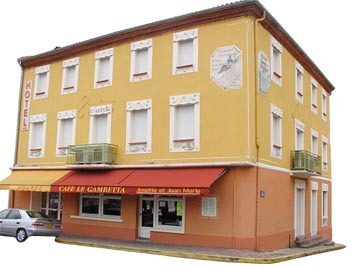 Very friendly staff are avaible to welcome you at the Café-Hotel " Le Gambetta". Having arrived from the North in dec. 2000, they have totally renovated the establishment. You have the possibility to have something to eat at neighbouring restaurants. The hotel is 17 km from Albi and 100 km from Toulouse. Take the time to visit Monesties, Cordes and the surrounding localities. Des façades originales aux couleurs méditerranéennes où des fresques peintes à la main reprennent un peu la vie de CARMAUX. Elles honorent la mine, les verriers et les paysans sur 3 magnifiques cadrans solaires. The façade are in original Mediterranean colors with hand painted frescoes representing a little of life of Carmaux. Three magnificent sundials depict the mines, the glass blowers and the local country poeple.